I have a complicated relationship with the quartet of modules set in Southern Middle-Earth. 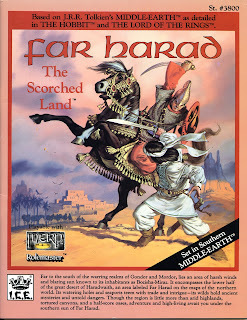 The Court of Ardor is truly outstanding, and Greater Harad is something I made outstanding (or so I like to think), while the other two dance around the lackluster: Far Harad is just there, and Shadow in the South, for all its muscle, a jumble of artificiality. Yet if you had asked me back in the day, I would have rhapsodized about all of them almost as much as Ardor, and quite sincerely. In retrospect, I was more inspired by the ideas behind them than their actual content. My friend and I got good use out of them, but it's painfully clear now that the best parts came from us. 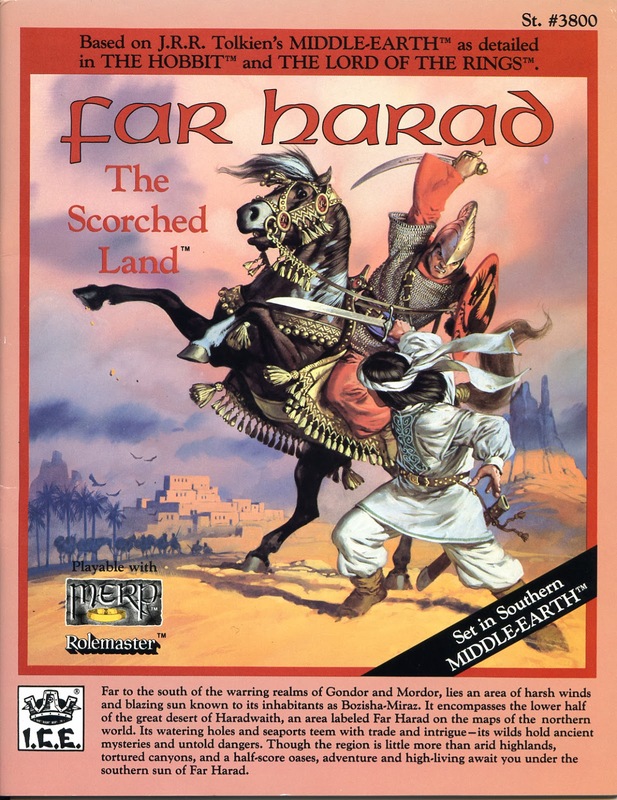 Far Harad, in particular, is surprisingly barren for an exotic region. It could have easily been the MERP equivalent of TSR's Oriental Adventures, standing on the vision of a distant alien culture with harsh codes of honor and shame. But none of this is fleshed out significantly beyond the impact of religious myths. There is the sun god Vatra, not warmly received by Harad's people, who scorched the lands into desert. This was in fury over his wife, the moon goddess Ladnoca, who had turned against him for slaying her father. She is the common object of worship, and the coastal capital of Bozisha-Dar is named after her ("Gift of the Goddess"), despite its cosmopolitan outlook which pits it against the tent-city of Tresti leagues away. Aside from this dynamic, there isn't much meat on the backbone of Far Harad; almost nothing about the desert nomads outside urban areas. I do appreciate the module's base value. It's almost an archetypal sandbox (and literally), with little plot to it; the Council of Regents has been ruling stably in Bozisha-Dar for the first half of the Third Age (the time period is 1640), and will continue doing so until the savage Sun-Lord dynasty takes control (2194-3019). There's no conflict outside vague tensions between the capital and Tresti, but it's a perfect set-up. I can think of many TSR classics I'd use in Far Harad -- The Lost City, Hidden Shrine of Tamoachan, and certainly Tomb of Horrors, to name a few. There's something about deserts that lend to pulpy D&D scenarious; I also approve the catalog of native wilderness creatures: sand devils, ghoul-like lesinas, sand drakes, and best of all, the Razarac ("Destroyer") which is basically a desert Balrog. The mapwork delivers with about as much enthusiasm as the rest. Detail focuses on the city of Bozisha-Dar, particularly the mansions held by the seven regents which have some admittedly eye-catching design: the House of the River's Breeze (built of white marble pillars and no solid walls) run by the Lord of the Port; the Mansion of the Moon (with windows barely translucent by day, but funnel moon- and starlight perfectly), held by the Ambassador to Tresti; the Palace of Water (a popular site of entertainment) for the Water Minister; the House of Warcraft (resembling a desert fortress) where the Commander of the City Guard resides; the cleverly constructed Nomad's home (stone overhangs being fashioned in the shape of desert tents) supervised by the Watcher of the Caravan Grounds; the Palace of the Wood (mirroring the exotic flora of the Forest of Tears) run by the prestigious Ambassador to the Foreign Powers; and the Soul of the Desert (a microcosm of the Harad territory) for the Ambassador to the Nomads. 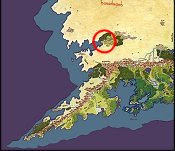 For campaigns involving political intrigue these areas can be put to aesthetic use. But beyond this, and an overview of the sacred tent-city of Tresti, few areas are sketched out. All in all, Far Harad sits like an unfinished product; either the author lost interest, or he just didn't know what to do with it.